This guide will show you the process of importing your timesheets into CloudPayroll/iPayroll. CloudPayroll (AU) and iPayroll(NZ) are the same product however they are optimised for Australia and New Zealand respectively. 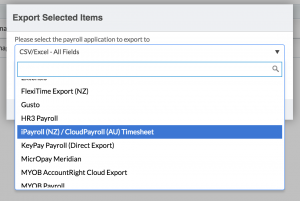 Deputy Timesheet export will produce a file that allows importing into CloudPayroll (AU) / iPayroll (NZ). To ensure the most successful import into CloudPayroll/iPayroll, the following steps are recommended. Ensure the Employee Time Sheet Export Code matches the Employee ID in iPayroll. Ensure the Area export code in Deputy matches the costCentre in iPayroll. To set up Deputy for exporting time sheets, please follow the instructions here. You can choose CloudPayroll/iPayroll in the list of packages Deputy supports and hit export. Navigate to upload screen of iPayroll to upload the file generated by Deputy.